Rockwall Dermatology is the dermatologist of choice for many North Texas physicians and health care networks who refer patients for dermatology expertise. Those referring and our patients experience the entire team's dedication to providing high-quality cost-effective health care that is always result-oriented. Our relentless efforts toward this goal have earned us the highest level awarded - Tier 1 - with multiple insurance networks. So whether you're seeking medical, surgical, or cosmetic dermatology expertise, board certified dermatologist Dr. Jessica Saucier MD, FAAD and master aesthetician and laser technician Gina Hunt LE, CLT combine to provide the latest advanced treatments, assessments, and recommendations to patients with all sorts of dermatologic concerns. 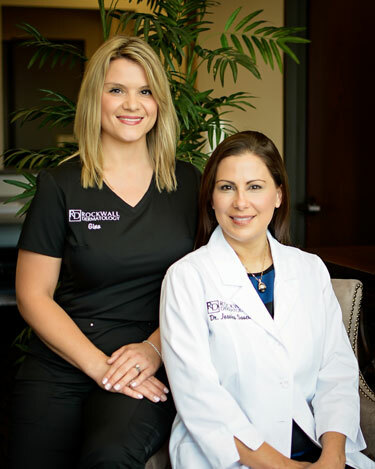 "We opened Rockwall Dermatology in 2015 so we could care for patients as we would our own family, and that philosophy guides everything we do. Simply put, we want the very best for you." Prevent and address the signs of aging and revitalize skin to enhance a healthy glow and appearance. Dermatologic surgeons routinely treat skin cancers, cysts, and moles with a variety of surgical techniques. A gentle and effective non-invasive resurfacing facial to enhance the health and appearance of skin. Improve lines and wrinkles, age spots, photodamage, acne scars, rosacea, hair reduction, and more. The latest techniques and products to help you look refreshed and a little more youthful. "Everything and every one are exceptional at this office! Wish I had found this place sooner! Very professional, and comfortable. Thank you." Neuromodulators target a cause of lines and facial wrinkles around the eyes, forehead, and more. The only FDA approved injectable drug that improves the appearance of "double chin". See what Kybella® can do. A safe, no-downtime non-surgical ultrasound treatment that counteracts the effects of time and gravity on your skin. See what Ultherapy® can do. Everyone at Rockwall Dermatology is committed to first-class patient care, and we think you'll notice a difference beginning with your first phone call. Don't just take our word for it... read what our patients are saying about us. Here's a map. We are honored to know that our patients travel from far away for our medical and cosmetic dermatology services. Those living in the neighboring East Dallas communities of Forney, Garland, Greenville, Heath, Murphy, Richardson, Rockwall, Rowlett, Royse City, Sachse, and others know that they have a quality option nearby. Want to dive into the details? Check out a few topics at clinic info. You'll find information about how to prepare for an appointment, some of our policies, insurance networks, how to complete intake forms, and more.